VANCOUVER, British Columbia, Oct. 22, 2018 (GLOBE NEWSWIRE) -- American Pacific Mining Corp (CSE: USGD / FWB: 1QC / OTCPK: USGDF) (“APM” or the “Company”) is pleased to issue this corporate update following an active exploration season. 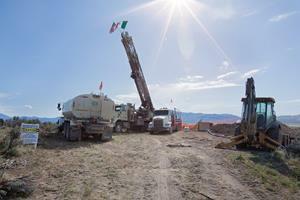 APM completed >10,000 feet of rc and core drilling at the Tuscarora Gold Project, 50km northwest of Elko, Nevada. In addition to successfully confirming previous high-grade at Tuscarora in the South Navajo zone, APM extended the known mineralization 450m to the North with hole APTU-013. The project, a high-level, low-sulfidation, epithermal gold prospect, is located in the historic jurisdiction known as the Tuscarora Mining District. The Property lies at the foot of Mount Blitzen on the eastern slope of the Northern Tuscarora Range, an area known for extensive precious metals exploration and mining in the past. Once the CSAMT is complete the Company intends to permit and plan a 20,000ft drill campaign. The Tuscarora property tripled in size in March of this year, and a comprehensive Controlled-Source Audio Magnetotelluric Technique (CSAMT) survey across the entire property has never been done before. This type of survey involves transmitting a controlled electric signal at a series of frequencies into the ground from one location and then measuring the received electric and magnetic fields from another location. On July 18, 2018, APM identified a series of veins that were tested and locally mined where exposed at the surface in the late 1800s, but minimally explored when they dipped under pediment gravel. Technical aspects of this press release have been reviewed and approved by Eric Saderholm, P.Geo., the designated Qualified Person (QP) under National Instrument 43-101. American Pacific Mining Corp. is a gold explorer focused on precious metal opportunities in the Western United States. Tuscarora is a high-grade, early stage gold project located in a prime precious metal district in Nevada, only 35km northeast of the Carlin trend, 20km southwest of the Jerritt Canyon deposit, and 50km east-northeast of the Midas deposit. American Pacific is Eyeing a Gold Discovery amidst gold’s next bull market. On Behalf of the Board of American Pacific Mining Corp. Forward-looking statements are statements that are not historical facts; they are generally, but not always, identified by the words "expects," "plans," "anticipates," "believes," "intends," "estimates," "projects," "aims," "potential," "goal," "objective," "prospective," and similar expressions, or that events or conditions "will," "would," "may," "can," "could" or "should" occur, or are those statements, which, by their nature, refer to future events. The Company cautions that Forward-looking statements are based on the beliefs, estimates and opinions of the Company's management on the date the statements are made and they involve a number of risks and uncertainties. Consequently, there can be no assurances that such statements will prove to be accurate and actual results and future events could differ materially from those anticipated in such statements.